Cancer Crossing: OUR FOUNDER DR. LUK, HAS RECEIVED YET ANOTHER AWARD!! OUR FOUNDER DR. LUK, HAS RECEIVED YET ANOTHER AWARD!! 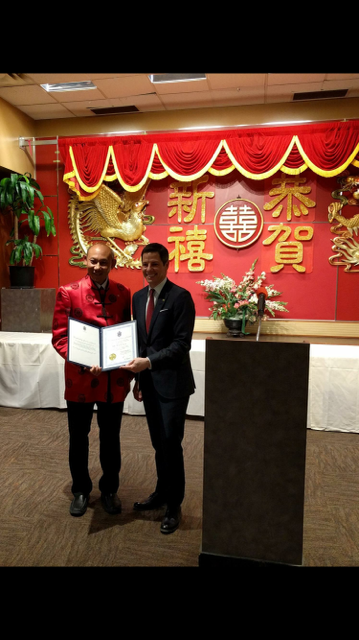 On Jan 31, 2016, our founder, Dr. Tse Li Luk, received a City of Winnipeg Community Service Award from Mayor Brian Bowman! Citation - Dr. Tse Li Luk, O.M. Dr. Tse Li Luk is a family physician based in Winnipeg, Manitoba. He considers himself blessed with two professional passions, namely medicine and photography. He has donated his award-winning photographic prints to help raise funds for many local, national and international charities. He is also an avid volunteer and has donated his time and talent to various local charitable events around Winnipeg. In 2013, Dr. Luk founded Cancer Crossing which is an entirely volunteer run organization that raises funds for cancer patients. Cancer Crossing published a patient companion book and fundraiser for cancer patient services across Canada. The Cancer Crossing book is a compilation of stories of cancer patients and caregivers accompanied by touching black and white photographs.